Being the youngest of three, with two elder brothers, I always seemed to cling to my mother’s side, especially in the kitchen. I remember watching her in awe as she separated the eggs, creamed the butter, dusted the pan with flour and pulled the pan off heat at the correct time and temperature (all with out a thermometer! )when making caramel. Her caramel butter cake was one of best cakes I’ve ever eaten to date. When I grew older, mum was more than happy to let me take the reigns, as she kept a close watchful but encouraging eye on me as I moved around finding my feet and in the process my confidence in the kitchen. Watching her confidence in me strengthened my love for baking and by 18, I was crowned my family’s official baker! an honour, I’ve always cherished. Now a proud mother to two little ones myself, I find them watching me in the kitchen too. They are always eager to help in the baking process, but somehow I feel they are equally enthusiastic about the batter as they are about the finished cake! Together with the support of my business partner/soulmate, we are a small boutique cake business. For me, Sugar Pot is about simplicity, wholesome food made with loving hands. I believe in the warmth and comfort of my family and in the beauty of nature that GOD has created. It is this sentiment with which each and every cake/cupcake of mine is made with. We are proud ambassadors of Baked from Scratch. All our cakes are made from scratch using fresh, high quality organic dairy and eggs. Butter makes all things Better. We only make the Swiss style of butter cream to use as fillings for all our cakes. That means real fresh egg whites, sweet cream butter, premium vanilla, and real home-made fruit compotes…no artificial shortening in sight. No shortcuts. Cake box mixes are non existent for us. Our cakes are free from artificial flavouring..Using the best available. 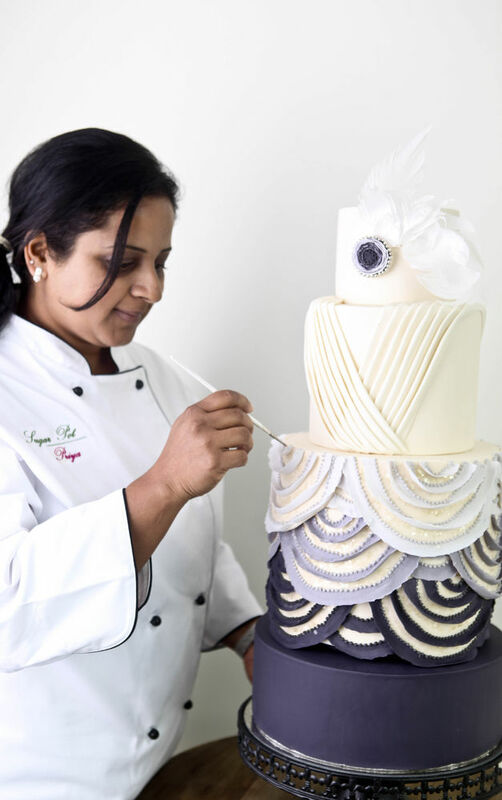 Sugar Pot’s cakes are covered in pure and rich 70% Belgian Dark chocolate and Belgian White chocolate. Above all…..Our’s is a sustainable business model where we believe in supporting our community and farmers. We always endeavour to purchase our ingredients locally and from an organic sources. Our philosophy is simple....never compromise on the quality of ingredients and craftsmanship.